Summer in Colorado. Railroad to Pikes Peak. Four years ago on a lark I drove from Boulder to Colorado Springs and then to Manitou Springs to take the Cog Wheeled Railroad to the summit of Pikes Peak. Little did I know that you needed reservations for the cog rail trip to Pikes Peak, and that all trips were sold out for the day. I was very lucky that someone in line before me was unhappy that their party was not all sitting together and turned in their tickets. Once I got on board the train, I realized that I won the lottery since my ticket was for the front seat. This allowed me to set up a tripod and camera to capture images for a time-lapse video for the train ride. So as not to annoy the other passengers on the train I used a small Gitzo travel tripod, my smallest camera body, and a small lens. Going up the mountain I used a 18-200 mm lens at 18 mm. Going down the mountain my seat was now in the rear of the train looking back. For this I used a 10.5 mm fisheye lens. This was a case of being in the right place at the right time!!! 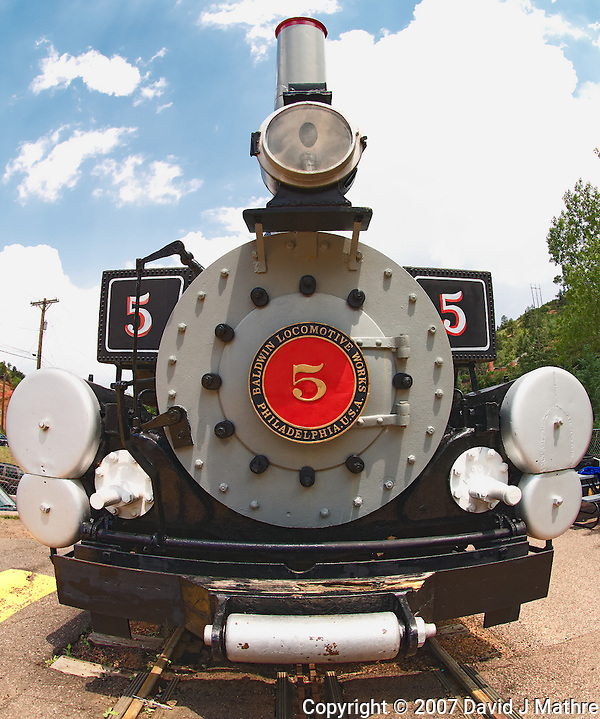 Steam Engine at Pikes Peak Cog Railroad. Image taken with a Nikon D200 and 10.5 mm f/2.8 fisheye lens (ISO 100, 10.5 mm, f/5.6, 1/250 sec). Raw image processed with Capture One Pro, Focus Magic, Topaz Define, and Photoshop CS5.